When strolling through the Auld Kirkyard at New Cumnock take time to pay your respects to the Callan family. But what is their story? This branch of the Callan family’s connection with New Cumnock began with John Callan and his wife Mary Hunter setting up home at Grieve Hill, the small miners’ row attached to the Mansfield Colliery. John, from Durisdeer, Dumfriesshire was the son of Archibald Callan, a lead-miner and Isabella Meggat. His wife Mary was the daughter of John Hunter, an agricultural labourer in Morton, Dumfriesshire and Isabella Somerville. The family appear in the 1841 Census records as coal miner John and Mary at Grieve hill along with their six children – Archibald (b. 1823) and Tibby (b.1827), both born at Sanquhar, Dumfriesshire along with the New Cumnock born trio of John (b.1836), Mary (b.1838) and Jane (b.1840). Mansfield Colliery with the small row of houses at Grieve hill. Two years later following the great schism (‘The Disruption’) in the Church of Scotland many of the parishioners in New Cumnock left the Established Church to join the Free Church of Scotland. John was a member of the Free Church committee that quickly set out to build a new church on the castle-hill, the foundation stone being laid on 29th August 1843. By the time of the next census of 1851 John had established himself as a grocer based at the Castle. He was one of four grocers in New Cumnock listed in the Ayrshire Directory of that year, the others being Mrs.Brown, Castle along with William Aird and Hugh McKerrow both at Pathhead. Youngest son John (16) found work as a shoemaker’s apprentice while eldest son Archibald (27) remained at Grieve Hill working at the colliery on the hill as an engine keeper. John Callan relocated his grocer’s to Mansfield Village and set up home at Pathhead where his bachelor son Archibald, returned to the family home, now working as a coal miner, presumably at the nearby Pathhead pits. Meanwhile youngest son John had not only left the family home but had left New Cumnock and moved to the Newton and Wallacetoun district of Ayr (in the parish of St. Quivox) where he followed in the steps of his elder brother Archie and worked as an engine keeper at the nearby coal pits. John lived at Content Street, on the north side of the River Ayr and in 1858 he married Carluke-born Margaret Robertson, dressmaker who lived at the High Street, south of the river. She was the daughter John Robertson, underground pit manager (possibly at the same pit at where John worked) and Janet Murray. John and Margaret set up home at George Street, just round the corner from Content Street, where sons John (b.1859) and James Robertson (b.1861) were born. It is under this address which John Callan, engine-keeper appears in the Ayrshire Directory (1861). [N.B. in the 1861 census the family address in given as Youngs Land, parish of St. Quivox]. When third son Archibald is born the following year, the address is given as Whitletts, St.Quivox. Soon after John returned to New Cumnock with his family during a time of significant developments in the New Cumnock coalfield. John Hyslop of Bank had formed the Bank Coal Company in 1860 and three years later he established a branch line from the major Glasgow & South Western Railway line to the Bank pits. 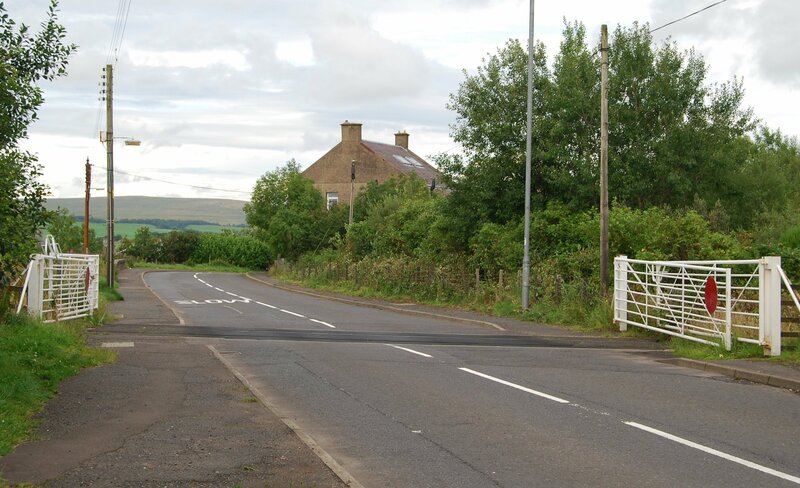 This line cut across the New Cumnock – Dalmellington road at Connelburn where it was necessary to set up gates and a level crossing as well as a gatehouse. It was here that John Callan, engine-keeper set up home and that his young wife Margaret probably managed the closing and opening of the gates. Sadly, John was struck down by fever for several months before dying of dropsy at the age of 30 years old. His death certificate refers to the gatehouse as the Railway Cottage, while his headstone in the Auld Kirkyard at New Cumnock records the local name of Gatehouse, Connelburn. The gatehouse would have stood behind the gate on the right. Margaret (27) moved the family to Maryhill, Glasgow and lived with her sister Barbara Robertson, a grocer and provision merchant. Through time, and in Callan tradition, son John found employment as an engineer-turner and son Archibald entered the grocery trade; while middle son James worked as a clerk in the local gasworks. Back at New Cumnock the Callan family moved to Pathbrae where John and son Archibald also owned and rented out some of the adjacent properties. In 1873 Mary passed away and was laid to rest in the family plot at the Auld Kirkyard. The following year 73 year old John married his housekeeper Margaret (57) and moves to nearby Pathhead, where the Callan family again own and rent out adjacent properties – son Archibald with a number in Polquheys Road. John passed away in 1886, aged 79 years and his name alongside that of and ‘Merchant, Pathhead’ is carved on the family headstone. Archibald passed away at Polquheys Road, Pathhead in 1897 aged 73 years and rests along with his brother , father and mother in the Auld Kirkyard. John Callan’s second wife, Margaret Patrick died in 1900, aged 81 years and presumably is buried in the Afton Cemetery. This entry was posted in Auld Kirk, Headstones and tagged New Cumnock, New cumnock Auld Kirk. Bookmark the permalink.